As part of the Moms of Master Books, every month, I have the chance to explore one of the new resources put out by New Leaf Publishing Group, specifically the homeschooling arm of Master Books. 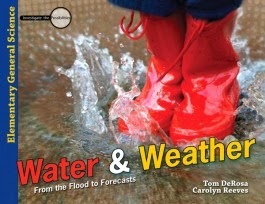 This month, I've been looking at the newest book in a series of Elementary Science titles -- Water & Weather. Written by Tom DeRosa and Carolyn Reeves, this title lives up to its Investigate the Possibilities predecessors! Because I'm not really in a position of making a decision about the resource before I receive it, I hadn't truly read the description of the book prior to receiving it. I saw the cover, read the title, and assumed that we'd be learning about water cycles, weather patterns, climate, ocean zones, etc. I'll confess that I was a little taken aback when I grabbed to book to do the first lesson with my 2nd and 4th graders (the ideal range for this entire series is 3rd-6th grade) and it started off with all kinds of activities involving measuring dinosaurs. Going back and more thoroughly reading the subtitle (From the Flood to Forecasts) and the description of the book, I shouldn't have been surprised. My kids, to be quite honest, felt a little cheated. "Mom, we already know this flood stuff. I thought we were going to learn about weather NOW." My kids really did not want to do those first six lessons. For kids who are not surrounded by young-earth creation resources most of the time, those first lessons are interesting, with all the signature marks of this series -- getting the kids in there doing something, and then investigating the science involved. Maybe the Water & Weather Teacher Guide gives a bit more of a heads-up to the parent as to how the first portion of the book relates to the whole theme of the book? I don't know, as I haven't seen that portion of this program. I can tell you that this book is completely usable without the Teacher Guide though. When we skipped ahead and started looking at the ocean lessons, my kids were fascinated. Using materials like a half-gallon milk carton and water, the kids had the chance to truly see how water pressure works, for instance. And the photos provided in the book are beautiful. In looking ahead, I really love the weather lessons and cannot wait to get to those. That section has the kids building a lot of their own weather equipment, such as a wind vane, barometer, and rain gauge. That's just one lesson. Other lessons focus on clouds, forecasts, winds, and more. This really is a great book. I just wish I had been a bit more prepared for the "how big is a dinosaur?" lesson that starts the book off. There is a Book and a Treat Facebook party coming up tonight, February 25 at 7 pm Central Time, where you could win cool prizes as shown above -- and discuss the book too.